Guide on defeating Dreadtooth at difficulty from 1- 10 stacks. Dreadtooth spawns and roam around on a circular pattern in a fixed location in Belsavis Section X area. Quickest way is to purchase the legacy perk for Black Hole daily area and then click on the shuttle to head to Section X. Generally you can find him in an open area on the NW side of the map (i.e. Crumbling Wall section of the map). Dreadtooth respawns 30 minutes after death. Difficulty is dependent on the stacks of Dreadful Resurgence Dreadtooth has. 1-2 stacks are designed for 8m, 3-4 stacks designed for 16m. At 5 stacks, be gain a buff called Frenzied and requires a 24m raid to kill him. At 10 stacks, he gains a buff called Nightmarish and drops the amulet required to unlock the secret boss in 16m HM Terror from Beyond. The difficulty increase from 5 to 10 stacks isn’t too big so most guilds can just jump to 10 stacks if they can defeat Dreadtooth with 5 stacks. Dreadtooth will drop 1x http://www.torhead.com/item/dr6bs8K/dreadful-essence when killed that can be used on Dreadtooth to increase his stacks by one per use. He will reset to 1 stack of Dreadful Resurgence each time he is killed. Dreadtooth has 2.3 million HP at 1-2 stacks. 7.4 million at 5 stacks, and 7.84 million at 10 stacks. 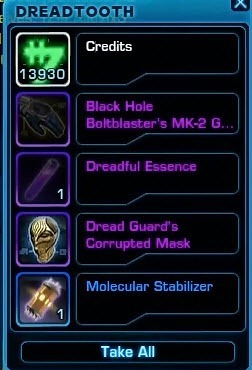 At 1-2 stacks, Dreadtooth will drop 1x Black Hole piece (random), 1x http://www.torhead.com/item/dr6bs8K/dreadful-essence, 1x http://www.torhead.com/item/aRTq4tQ/dread-guards-corrupted-mask, 1x http://www.torhead.com/item/guPvKRe/molecular-stabilizer The mask is essential for the secret boss, Dreadful Entity, in Terror from Beyond but not needed for Dreadtooth. 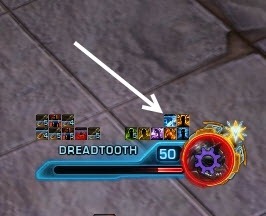 As of Patch 1.7, Dreadtooth killed on 10 stacks have a 100% chance to drop Dwedtoof pet, which requires Champion standing with the Section X reputation folks to use. This fight is a bit healing intensive and at higher stacks will become a healer check due to the amount of AoE raid damage. In addition, proper positioning of Dreadtooth (i.e. tank against a wall) is essential as Dreadooth will toss tanks miles away with one of his abilities otherwise. Dreadtooth also cleaves so no one should be standing in front of him except for the tank. 1-2 stacks can be done with 1 tank and 2 healers but higher stacks will require 2 tanks and more healers. Generally, for 5-10 stacks, you will want 8 healers to deal with the raid damage, 6 of them preferably are sorcs/sage for their AoE bubble heal. Sonic Paralysis:5 second channel that damage & stun the tank. 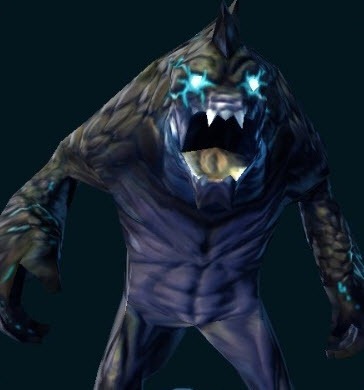 At the end of the channel, he will knock the tank back(position yourself in front of a wall), drop threat, and apply the Exhaustion debuff on them that will increase their damage from Dreadtooth. The second tank can taunt near the end of Sonic Paralysis channel to receive the Exhaustion debuff & threat drop instead (have the previous tank taunt back). Sonic Paralysis seems to first occur near 75%. Note that Exhaustion Debuff does not apply until Dreadtooth is at 5 stacks or more. Rock Heave: Red circle under the tank where Dreadtooth will throw a rock; avoidable and usually comes after Sonic Paralysis. Below 5 stacks, this has a castbar of 4 seconds. At 5 stacks or more, Rock Heave no longer have a castbar. Tanking mechanics do not really change above 5 stacks except Dreadtooth hits much harder. Dreadtooth have two phases in which he will throw different abilities at the raid. Phase 1 is from 100% to 50% and phase 2 is from 50% to 0%. Phase 1 is generally much easier and quicker than phase 2. Tanks do not need to worry about phase change as Dreadtooth will do the same Sonic Paralysis attack regardless of the phase. Rock Toss: Directed at mostly ranged characters.This is an attack that will deal quite abit of damage + a cleansable Bleeding DoT (it is called Rock Toss: Bleeding). 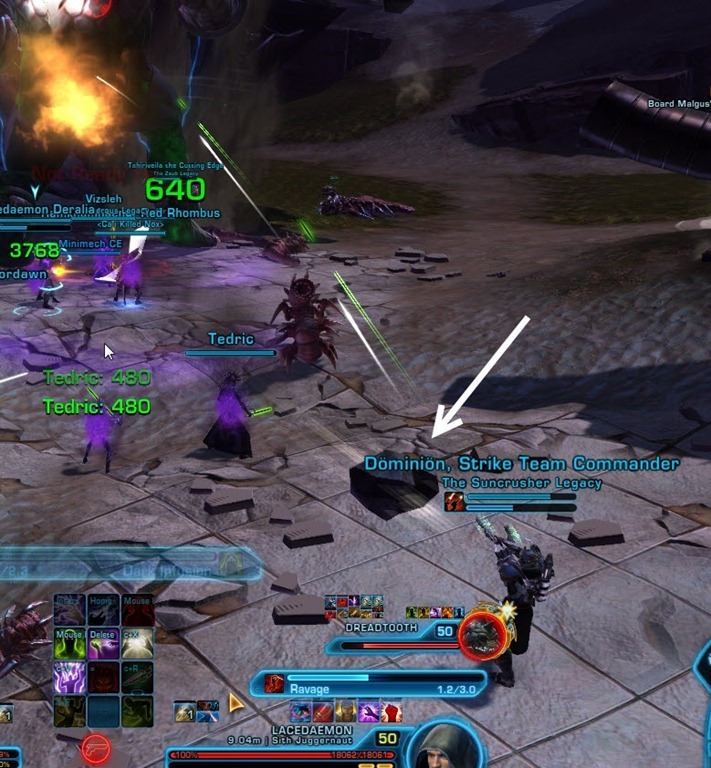 Raid can position ranged DPS at back of the raid and have them take the Rocks Toss damage at higher stacks. Smash: Proximity based AoE, deal damage and knock players up into the air. No castbar but similar animation to Smash on Zorn & Toth in Explosive Conflict (Dreadtooth jumps up and lands). Heal through it with AoE heals. Shriek: This abilities replaces Smash at phase 2 and deals a lot more damage. It is a 6 second channel dealing damage every second for ~3k damage per second (18k damage in total) at high stacks. This is a recurring attack with a 30-45 seconds cooldown (45 seconds at 1-2 stacks, 30 seconds at 5-10 stacks). 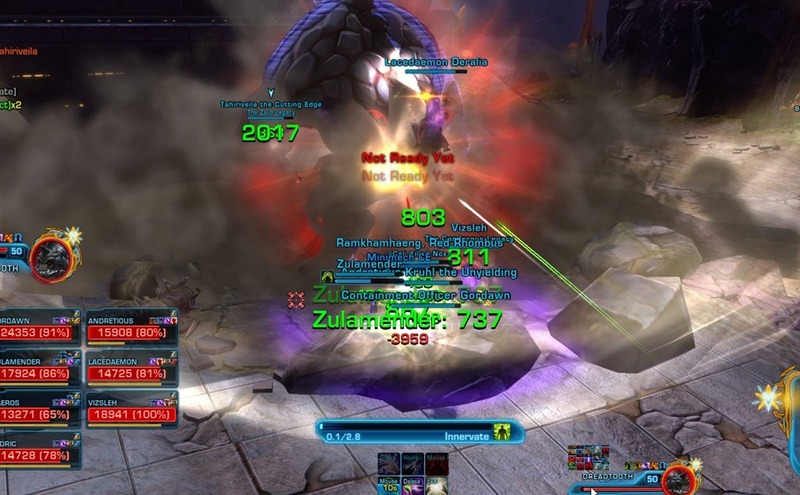 AoE heals are essential here to top the raid off and any raidwide defensive cooldowns (i.e. sniper shields) can be deployed here to help lessen the damage. 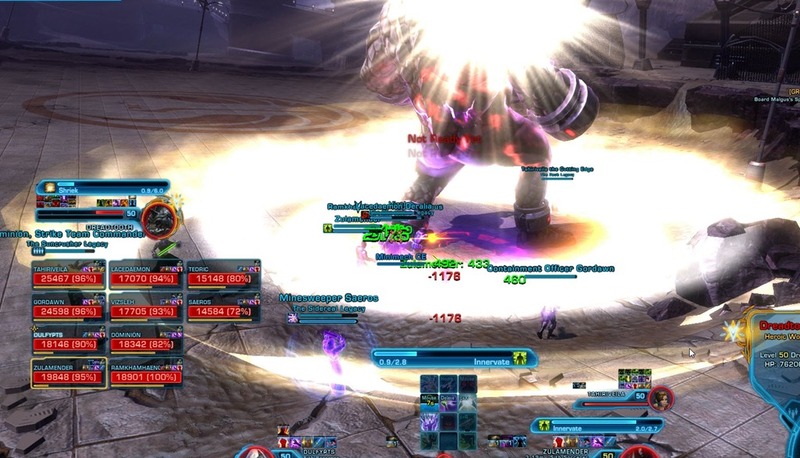 Raid need to stack together for AoE heals to mitigate the damage. 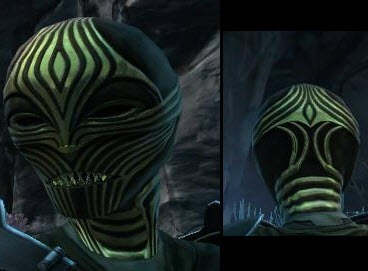 Electrified: This is a buff on Dreadtooth that comes immediately after Shriek and lasts 9 seconds. 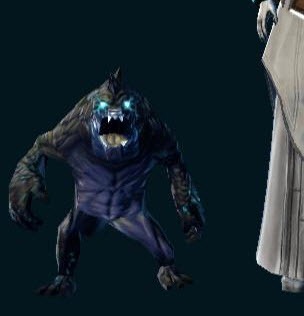 During this time, Dreadtooth will reflect all damage and kill whoever attempts to attack him. This is a mechanics that comes into play only at 5 stacks +. All DPS needs to stop attack immediately after Shriek and wait until the buff wears off. There are two types of Ground Spike here, distinguished in the combat log by the type of damage they deal. The Ground Spike dealing kinetic damage is the avoidable red circles with actual spikes coming out of the ground. The Ground Spike that deals elemental damage is the unavoidable Rock Toss like attack that is directed at the general raid and no longer aimed primarily at ranged characters (unlike phase 1). Both versions occur after electrified wears off and before the next Shriek occurs. Ground Spike (Kinetic): Multiple waves of red circles on the raid with rocks protruding out of them. These rocks will do massive damage to anyone caught in it and apply Ground Spike: Bleeding to them. This is a DoT that applies a constant tick of damage (500ish at 5-10 stacks) every second until it is cleansed off. Ground Spike (Elemental): This is just a modified version of Rock Toss that can hit anyone in the raid randomly. It will show up in the Combat Logs also as Ground Spike Elemental) but deals much less than the kinetic version of the Ground Spike.. Anyone hit by it will receive the Ground Spike: Bleeding DoT that can be cleansed off. Everyone need to spread out to avoid Ground Spikes and stack at the next shriek. 1-2 stacks is really easy and can be done with 8 people or less. You will want two healers, one dealing with AoE damage from Smash and Ground Spike and the other more focused on tank healing. 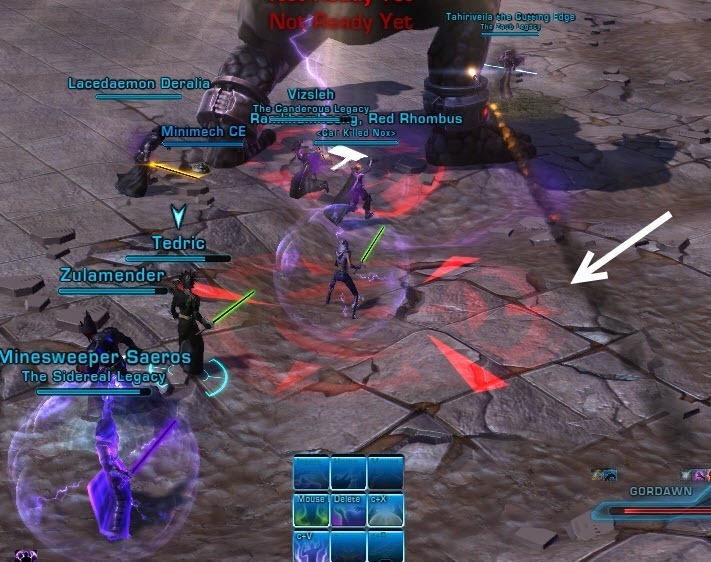 Rock Heave have a castbar and there is no Electrified buff on Dreadtooth or Exhaustion debuff on the tank (allow you to kill it with only one tank as long they taunt Dreadtooth back in time after the Sonic Paralysis threat drop). For phase 1, have your ranged DPS stay at the back (> 25m) and take the Rock Toss damage. For phase 2, the same ranged DPS (s ) can stay at the back and attempt to direct Ground Spikes onto them. Shriek is every 45 seconds. This video is from PTS with a kill of 2 stacks. Will be updated soon with a live server video soon. 3-4 stacks requires a 16m raid. 5 stacks give Dreadtooth the Frenzied buff and requires a 24m raid with 7-8 healers (ideally 6 of them should be sorcs/sages for their AoE bubble heal). You will also need two tanks to tank swap during/after Sonic Paralysis. 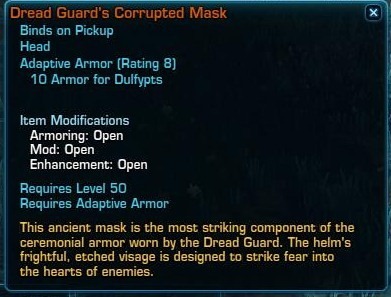 Dread Guard (Q63) gear is highly recommended. For phase 1, you will need 3 ranged DPS position about 25m away from the boss to eat Rock Toss. These ranged DPS will need a dedicated healer that will bubble, heal and cleanse them after each Rock Toss. Have 2-3 healers on dedicated tank healing duty. Rest of the healers should focus on bringing the raid back to full health after each Smash. For phase 2, the same 3 ranged DPS should stay out and try to direct the Ground Spike onto them if possible. They will need to run back to the boss to get AoE heals during Shriek. Raid will need to stack up during Shriek for AoE heals , STOP DPS and spread out during Electrified. During Ground Spike, your raid will get two circles. Whoever get hit will need to cleanse themselves immediately or call out for cleanse if they cannot do so themselves. 10 stacks Dreadtooth has the Nightmarish buff but he isn’t too different from the 5 stacks. If you can kill him at 5 stacks, there is a very good chance that you can down him at 10 stacks with some practice. You will want 2 tanks, 8-9 healers (6 of them sorc/sage healers if possible) and rest all DPS. Dreadtooth has about 400k more HP and hit slightly harder. He will cast have 3 circles down during Ground Spike that your raid will need to avoid. In phase 2, it is really really important that your raid stack up during Shriek for AoE heals and spread out during Electrified to avoid the damage from Ground Spike (kinetic) and lessen the raid damage from Ground Spike (elemental). Healers need to cleanse the DoT ASAP (if you see someone other than the tank taking a huge hit, cleanse them first, then heal them up since the DoT is connected to the Ground Spike hit). Shriek does 18k damage over 6 seconds, Ground Spike (kinetic), the red circles, deals 12k damage and the Ground Spike (elemental) deals 10 k damage. The goal is to lessen the raid damage as much as possible and cleanse the DoTs.